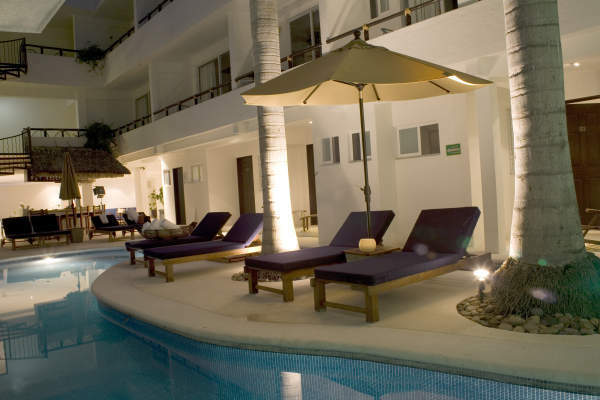 El Hotelito, or the Little Hotel, as it is known in English, occupies a wonderful Acapulco location. A very short walk is all that is required to get from the hotel to the beach, and for those who like to indulge in a little nightlife during their vacations, the nightclubs aren’t very far off either. Other things that El Hotelito guests can easily reach by way of walking are the city’s convention center and its main shopping malls. Essentially, the Little Hotel puts you right in the heart of it all. In terms of style, El Hotelito has a minimalistic contemporary edge. While not overly luxurious, it offers plenty of comfort to go with its style, and there is a satisfying array of facilities for guests to take advantage of on the side. The room count is 23, and among the standard amenities in each guest unit are a private balcony, Wi-Fi internet access, and air conditioning. Among the highlights in relation to the El Hotelito facilities are an attractive pool area and the inviting bar/lounge – El Barecito. It should be noted that El Hotelito has an adults-only policy and largely caters to the younger adult crowd.